Acanceh is a small town located in mexican state of Yucatan. Acanceh situated 21 kilometers from Mérida. The population of Acanceh is almost solely maya, with the mayan language predominantly spoken. Acanceh means “groan of the deer” in the yucatec maya language. 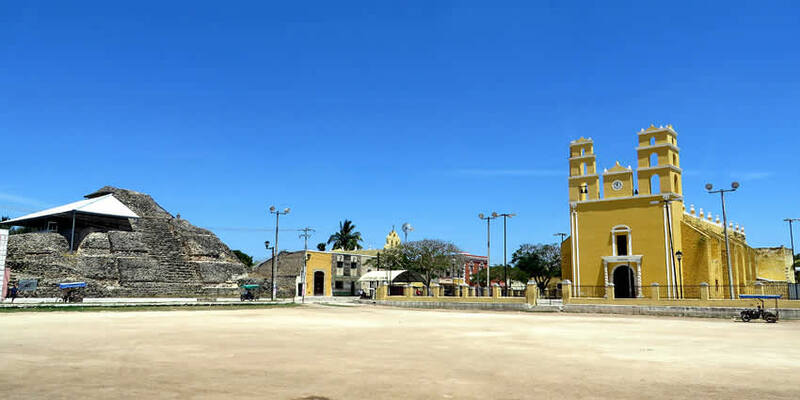 The town provides an interesting contrast – a town square with a mayan pyramid on one side, and a catholic church across from it. The central plaza is buzzing with activity. The pyramid is an odd sight on the edge of the plaza, but a refreshing one. In Acanceh, more than in other places, you can really sense the pride which locals have for their wondrous maya heritage. Acanceh was founded sometime between 200 and 300, during the Early Classic period. The ancient maya city covered more than 4 square kilometers, and had about 400 buildings. Three of these buildings have been restored and are open to the public, although recent excavations have uncovered more structures. Archaeologists date the ruins of Acanceh to 300 CE and the dawn of the Classic Era. At this stage in Maya history, the great cities were much farther south in Guatemala and the Chiapas region of Mexico. There’s reason to suspect that Acanceh wasn’t even founded by the maya – its oldest carvings are evocative of Teotihuacan, a powerful empire from northern Mexico. In a rare juxtaposition of the pre- and post-Columbian religions, Acanceh’s central pyramid is found right across from the town cathedral. The spanish must have been in an unusually good mood when subjugating Acanceh because mayan structures in populated towns were almost always demolished, so that their stones could be used as material for the new churches, but Acanceh’s pyramid was allowed to survive. The three-leveled step pyramid in Acanceh is 11 meters high. One of the older layers of the pyramid has been uncovered revealing several distinctive carved masks as part of the pyramid’s decoration. Archaeologists eventually discovered a secondary structure hiding underneath the outer layer of the pyramid – a sub-pyramid, crowned by eight enormous masks which look out over the town, two facing in each cardinal direction. You can climb the scaffolding for an up-close look at the sculptures, of which only a couple have survived relatively intact. Probably the most impressive is the one known today as the “Palace of the Stuccos”. Large stucco reliefs of mayan gods are found along the top edge, and have been carefully preserved. The “Palace of the Stuccos” is 50 meters wide, 6 meters high, and contains many elaborate friezes. This building’s design is very complex, with many rooms and detailed carvings. The architecture of the structures at Acanceh show a Teotihuacano influence, leading some to believe it was a “colony” of Teotihuacan. A steel roof carefully covers the stuccos on the pyramid above. You can pay admission, and the caretaker will let you in. Once inside, you can climb the front, or go around the back where there is an actual staircase to the top. Multiple stuccos can be viewed. They are quite large, and in reasonably good shape. It appears that the noses of many of them are missing, though otherwise they seem complete. They are quite large and impressive. The Parroquia de Nuestra Senora de la Natividad dates to the 16th Century, and is currently painted a brilliant yellow. The contrast of the yellow, along with the day’s deep blue sky, made for some beautiful pictures. The interior of the church is quite austere, as is typical in the smaller Yucatecan churches. This is a very simple chapel accessed by a series of steps. Inside there are a few pews, and a framed picture of the Virgin of Guadalupe. The chapel dates to the 16th century. Most easy and cheap way is take a second class bus from Merida bus station. You can also take a “collectivo” from Mérida to Acanceh. Or just take a taxi from Merida to Acanceh $5-$7 (0:30 min).